The classic horror movie series, including the new Nightmare (part 3), plus a special bonus chapter "The Life and Death of Freddy Krueger"! The classic horror movie series, including the new Nightmare (part 5), plus a special bonus chapter "The Life and Death of Freddy Krueger"! This book takes you through all 4 Nightmare On Elm Street films and the first episode of Freddy's Nightmares with exclusive interviews from creator Wes Craven and star Robert Englund. 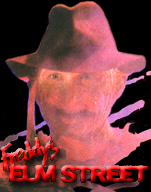 The official history of Freddy Krueger and The "Nightmare On Elm Street" films. Film adaptation for young adults. Ten years ago, legendary horror director Wes Craven created Freddy Krueger, one of the screen's most unforgettable monsters. Now actress Heather Langenkamp is about to return to her role of "Nancy," Freddy's first and greatest foe, in the newest and most ambitious "Nightmare" movie yet. But the line between fiction and reality becomes terrifyingly blurred, as Heather begins to have horrible dreams while mysterious accidents threaten those around her. As the ultimate "Freddy" movie rushes into production, the cast and crew find themselves stalked as though Freddy himself had escaped from the movies into real life. But Freddy Krueger is just a fictional character... or is he? Alicia has it all: good looks, talent and the star of the football team for a boyfriend. Why then is she hanging around with "weird" Evan, the nerd? Evan is the biggest dweeb in school and Alicia feels sorry for him and all the cruel jokes her friends play, but sympathy only makes it worse. The nicer she is to Evan the more they beat him up. Then Alicia's friends begin to disappear. A dead cat with the eyes plucked out is found in the trunk of a car and a terrible accident is about to happen. But will it really be an accident? "No!" Al Bellowed in his sleep. "He can't be! It was all a joke! I was only joking! Noooo!" his features contorted into a gruesome mask of revulsion. And then Al suddenly rose from the bed and came at Chip like a lunatic caught in a trance. Before Chip knew what was happening Al had his meaty hands around Chip's neck. Chip tried to pry his brother's hold loose as he realized he couldn't get any air. He slapped his brother in the face as hard as he could, but Al's grip only tightened. "Al!" Chip croaked hoarsely as Al's steel like fingers bit into the skin of his throat. Al was strangling him to death! As soon as Keith removed the 3-D optical illusion poster from his Virtual-illusions bag, he felt that queasy feeling again. It must have been the frozen yogurt he ate at the mall that afternoon. He tuned back to the poster and positioned it to nail it into the wall. On the third blow he missed the nail entirely and struck the back of his lift hand full force. Keith yelled and dropped the hammer. It landed dead center on the poster - and bounced off the glass. This was no ordinary poster. If only Keith could have seen it for what it was-- an omen of a dangerous force that would be beyond his most horrifying nightmares. Just because you get a glimpse into the future doesn't mean you have the ability to change it--perhaps you can only live in terror until it's your turn! Springwood High sophomore, Collen Martini is plagued by a recurring dream... of being burned at the stake. It's been a year Laura Walker would just as soon forget-- especially since she broke up with her boyfriend and lost her lifeguard job at the Springwood municipal pool... Great. No boyfriend. And now no job. Luckily, Laura bumps into a classmate who works at the local hospital, and he thinks he can arrange an interview for Laura. The boy is new in town, and Laura likes his easy smile and dark eyes. Best of all, he isn't anything like her old boyfriend, Chester. He seems to like her too. Laura realizes that it may not be such a bad summer after all. But when a killer goes on a bloody rampage, Laura must confront her worst fears and suspicions about the new boy in town. Is he Laura's dream come true? Or is he her worst nightmare? It's Halloween in Springwood and the place to be is the old Appleby mansion where the lord of the manor is none other than Jack Spyder, himself. The teen idol Jack throws a Halloween bash - the party to end all parties. Not only has the local boy-made-good returned home, but it has also been rumored that the accident which Jack himself had been in had ruined his clean-cut good looks. Will he be as hideous as the gossip papers have suggested? Will the party go beyond Springwood's wildest expectations? Everyone is literally dying to find out. Writer, producer, and director Wes Craven has successfully tapped into he horror vein for over thirty years, serving up scary, funny, hip thrillers that demand a second look. His films have been both crucial and commercial successes, most notably 'A Nightmare On Elm Street' which spawned a series of sequels and made Craven (and his creation, Freddy Krueger) an international sensation in the eighties. But Craven's films have also become classics in a field that he continues to reinvent the horror genre is still reeling from the impact of his most recent project, the brilliant 'Scream' series. With 'Screams and Nightmares', author Brian J. Robb cover's Craven's entire career, from his low-budget beginnings to his most recent box office hits. Every Craven film is covered from the banned thriller 'Last House On The Left' and the cult classic 'The Hills Have Eyes' to the outrageous 'Shocker' and 'The People Under The Stairs'. Through exclusive interviews with Craven, Robb provides in-depth accounts of the making of each of the films, and concludes with a section of the director's up and coming projects. With a full filmography and more than 200 black & White photographs, many from the director's own collection, 'Screams and Nightmares' is quite simply the only book of it's kind.